The Astronaut Light by Paladone | Nerd Much? The Astronaut Light by Paladone is a lamp that serves the function of a lamp while also giving your living space the perfect amount of a space aesthetic that you cannot get from any other ordinary lamp. If you’ve ever wanted to encapsulate that sense of childlike wonder and imagination when it comes to space exploration, then this is the lamp for you. 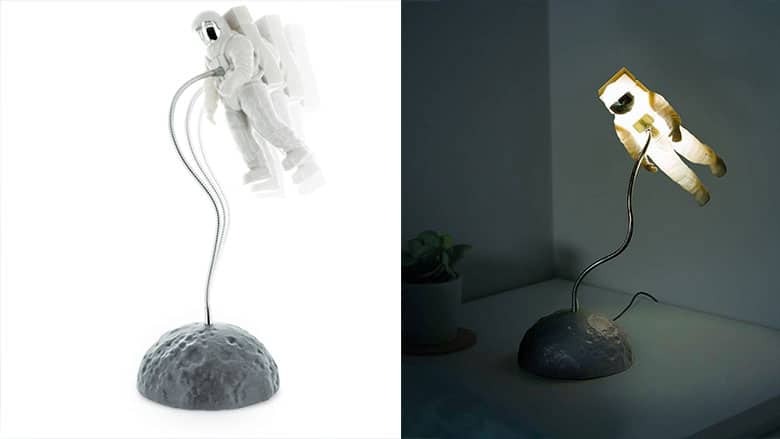 This astronaut lamp is perfect for any nerd, space enthusiast, moon lover, explorer, child, or imaginative person in your life. It stands at 10” tall and features a detailed plastic astronaut figurine on the end of a very flexible metal cable attached to a plastic half dome molded to look like the moon. When illuminated, the astronaut lets off a soft white glow. And although the lamp itself might not be very bright, it’s a perfect mood light or night light, showing the dark of space while also shedding the bright light of the spirit of exploration and starlight into the immediate area. The cable’s flexibility allows the astronaut itself to move about in a large range of motion, allowing you to shift the light and move it to wherever best suits your needs or sense of lighting aesthetic. You can place the astronaut hovering above the moon in high orbit. Or just off to the side, coming in for a landing! Or on the surface, making one giant leap for mankind. You can make the small space explorer roam anywhere in the cable’s vast range of motion, putting him in place, or reenacting the moon landing! The choice is yours! The lamp is powered by either 3 AAA batteries (not included) or with an included 1 meter long micro USB cable, easily plugged into the back of the moon base. So, whether you keep it plugged into an outlet or free range around the house with battery power, this moon lamp is sure to be a blast and add wonder and exploration to your home.